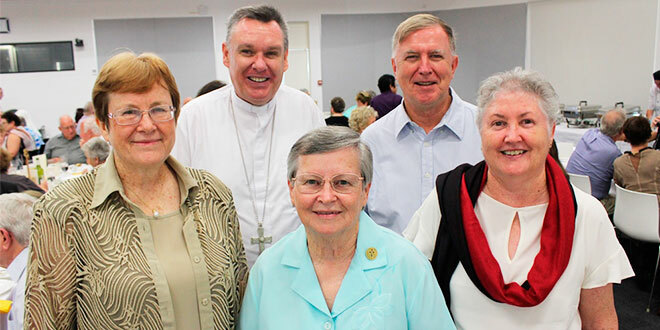 Lifelong profession: Mercy Sisters Sr Cheryl Camp, Sr Carmel Ruddick, and Sr Mary Lowcock with Bishop Tim Harris and Fr Mick Lowcock after their Golden Jubilee Mass. THREE women religious from regional Queensland who entered the convent of the Mercy Sisters 50 years ago reunited to mark their golden jubilees. Mercy Sisters Carmel Ruddick, Cheryl Camp and Mary Lowcock were three of eight women who entered the Sisters of Mercy in early 1965. They came together to mark 50 years since they made their first professions on October 7, 1967. All three sisters said the jubilee Mass with Townsville Bishop Tim Harris and Mount Isa parish priest Fr Mick Lowcock – who is Sr Lowcock’s brother – was an emotional day. “It was one of the happiest days of my life,” Sr Ruddick said. The huge congregation of more than 400 people at Holy Trinity Church made the day even more emotional. “The greatest blessing was to have our families there who have been there supporting us all our lives since we entered the convent,” Sr Camp said. Since entering the convent, the three sisters trained as teachers, initially taking up teaching roles in primary schools within the Townsville diocese. Sr Camp was later sent to minister to people in Papua New Guinea, Pakistan and Australian Aboriginal communities in Townsville and the Kimberley, working in education, administration, pastoral care and spiritual formation. “I wanted to be a missionary and help those less fortunate than myself, and the Sisters of Mercy had a mission in PNG,” Sr Camp said. “They said there would be a possibility for me to go to PNG and I was there for 11 years. “I wanted to help the Papua New Guinean people in education, parish life and spiritual formation. Across the Pacific, Sr Ruddick and Sr Lowcock spent time teaching and undertaking administration work in Townsville primary schools as well working at St Patrick’s Boarding School. But it’s the people they have met that have made a lasting impression on their religious life, many of them returning to celebrate the jubilees. “I met people that I’ve talked to, ministered to, people who have had their first babies,” Sr Ruddick said. “They are my extended family. “I only have one sister and she died some years ago from breast cancer, and her daughter and three children have become like my own. For Sr Lowcock, the past 50 years have been “a privilege”. “My life has been blessed,” she said. “When I look back on fifty years as a professed religious Sister of Mercy I am humbled at how many people have inspired and motivated me and what I have achieved. “Yes, I have touched many people through my years in teaching, leadership in parishes, diocesan pastoral planning, Catholic Mission and Catholic Religious Australia, Queensland but I have been the one to benefit from the giftedness of others.